A fruit-based confectionery common to Spanish regions that is made from quince fruit, sugar and water that is cooked together until it becomes a thick syrup. It is cooled and then formed into blocks or poured into jars. It is generally considered to be a paste that is served as a snack or dessert. 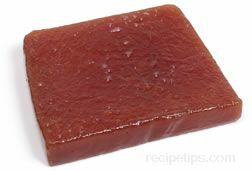 When served, the quince block may be spread on food or sliced into quarter inch thick pieces and placed on top or between slices of cheese, most often Manchego cheese. It is sometimes customary to serve almonds with the paste as it is combined with cheese. It is also known as quince paste, cheese, cream, or candy.